If you are looking for a simple yet effective poker chip design, the Crown & Dice 14 gram clay composite poker chip may be just what you are looking for. They feature an image of a crown within the edge spot, and the three different ways to roll a seven in dice around the edges. 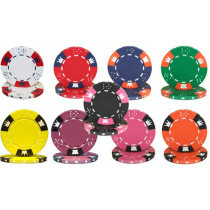 These are great quality poker chips at a great price! Note: Your set may not include all colors shown. These non-denominational chips are great if you change between cash games and tournaments often. You can set the values of the chips to whatever you like. For a tournament, you may need $100, $500 and $1,000 chips, while for your weekend cash game you may want them to be $1, $5 and $25. You decide.